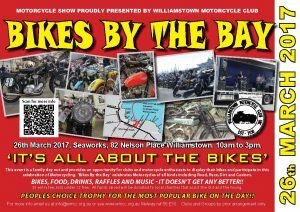 On Sunday 26 March 2017, the Williamstown Motorcycle Club will hold the 20th annual Bikes by the Bay at the Seaworks site, 82 Nelson Place, Williamstown. The event is open to the public from 10:00am until 3:00pm. Second, to raise funds to distribute among local charities, primarily aimed at assisting the old and young within our community. All funds raised are distributed to local charities, which are often overlooked by higher profile fund raising events. Funds are raised by the $5 entry, a raffle and the generous support of sponsors by providing prizes for the raffle or donating money directly to the event. Over the years bikes from all areas of motorcycling, from vintage to modern, cruisers to sports bikes, show bikes to rat bikes, and the everyday to the very unique have turned up at Bikes by the Bay. We regularly see rare and interesting machines brought out to give their owners a chance to sit and talk and share the more interesting aspects of their bikes with the public. Everything from a genuine works Ducati once campaigned by Bruno Spaggiari to custom Harleys and Triumphs make an appearance. Apart from all the obviously special machines we also have hundreds of everyday bikes which are special simply because they are loved by their proud owners. The outdoor bike parking areas are usually every bit as interesting to walk through as the pre-registered bikes on show in the Big Shed. There will be live bands on stage all day, food and coffee vendors, a sausage sizzle and a major raffle draw on the day, with the 1st prize of a TW Steel wrist watch valued at $800 donated by TW Steel. In 2017, as in the past two years, there will be only one prize awarded on the day. ‘The Peoples’ Choice’ award, donated by Filigree Jewellers, will be given to the motorcycle voted as the most popular by those attending the event. Unlike the past two years, bikes will need to be pre‑registered to be eligible for The Peoples’ Choice award. A copy of the pre‑registration form can be downloaded from the website. Owners of pre‑registered bikes are to arrive and be parked in the Big Shed between 8.00 and 9.45 am, and remain in place until the event is closed to the public at 3.00 pm. Also, the Big Shed and adjoining pedestrian areas are a ‘No Ride Zone’, in which bike engines must be off. Marshals will be available to assist riders to move their bikes to their allocated positions. The increasing popularity of Bikes by the Bay means we must restrict pre‑registration to Club Permit eligible and special interest bikes in 2017. All other bikes will need to park in the outdoor parking areas. The show has recently been seen as an excellent opportunity for business promotion, with several businesses which market motorcycle focused products and services displaying their wares.